BadgeWorks' high quality, name badges are the easy solution for any organisation. Our offer includes no minimum orders, free artwork and a 3-5 days turnaround. You supply your artwork or logo in electronic format, e.g. JPEG with minimum 300dpi works best or we can make something up for you. We also have no minimums when it comes to personal changes and replacements – our normal turnaround is within 3 to 5 working days. 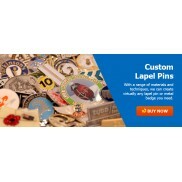 All Name Badges are fitted standard with pins, or for an additional charge, we can fit magnets which are great for protecting clothes or uniforms and are very strong. As well as our standard, plain, clean, white background we are also able to provide a low lustre silver or gold finish. Our turnaround is usually 3-5 days but we are able to provide an overnight service with enough notice. 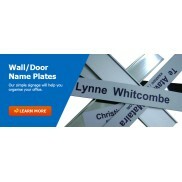 High quality, sublimation printed name badges with scratch and water resistant resin domed coating. 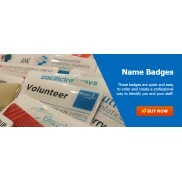 Affordable, high quality, sublimation printed name badges with laminated coating. 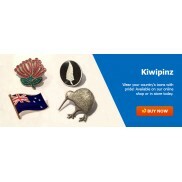 Step 2: Email info@badgeworks.co.nz with a description of how you would like your badge to look with names, job position, logo position, fonts and colours required and we will do the artwork for you. Basic artwork (usually 10-15mins, which is enough to for one style of badge) and set-up costs are free. You will need to provide good quality high resolution logos ie. at least a 300dpi JPEG in RGB format.